Last Sunday as I clipped the remaining perennials down in the front garden bed and Moon and Copper were resting comfortably sprawled out in the grass, basking in the sun, safe and secure within the confines of the fence, a pick-up truck pulled in the driveway. Once I saw that the driver was a thin, older man (at least in his 60's like me), I headed towards the truck. Smiling he rolled down the window and said, "I'm not here for a reason. I'm just a little lost. Can you tell me where this road would come out/" He looked like a nice enough man and I noticed approaching the truck with caution, that there was a dog in the front seat. While I thought of that as a "good sign," I did intentionally have my 10" blade clippers in my left hand. Getting face to face with the man, I now had a clear view of his "pup." The "pup" was rescued by he and his wife and was now 10 months old. "He's got Lab in him," he said with a broad grin. Me? I saw Pitbull first and foremost. Then I saw the large pronged choke chain around the "pup's" neck. I saw the solid, muscular black and white, about 70 lbs canine gaze at me, watching every move I made. Taking a step back, the man told me he was friendly and a "real love" as he patted him on the chest, saying "aren't ya, boy?" We chatted for a while mostly about dogs and then he asked if he could get out to give the "pup" a drink at the front creek. "Sure," I responded, ensuring that my clippers were right a my side as the dog approached to sniff my leg which now looked so small compared to the size of this "pup's" head! Moon and Copper had come over to the gate on the creek side of the house. The man had walked the dog over to the creek with the "pup" for a drink, when suddenly Moon appeared from no where! Fur up, teeth barred, she headed straight for the Pit. "Moon, NO!" I commanded. Stopping short of the man and his dog just as his "pup's" growl became more intense, Moon barked and growled, as I watched him struggle to hold the dog. Walking quickly to the gate, I called Moon and said, "In!" Reluctantly and slowly she came, looking over her shoulder with each step. 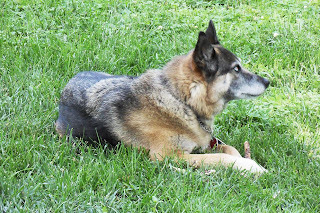 My fifty pound Shepherd Husky, a stray who wandered in off the mountain almost eight years ago, was trying to protect me from a seventy pound Pit with a massive head and shoulders! Once the man got his dog under control, he immediately put him in the truck as Moon and Copper watched carefully through the fence. No, it's not the first time Moon has "escaped" as my good friend Lisa will tell you! Moon has climbed the fence several times and even gone under water where it crosses the creek to be at my side. I guess now that she's been found, she never wants to be lost again! A good dog to have and a sensible mom to make her go back to safety. I don't like strangers who stop and I especially don't like strangers with big dogs. oh, that girl! i'm glad she listens to you, though, to avoid what could have been a very nasty confrontation! Dogs sense things and it is wise to listen to their judgements. I have a similar story. My dog grand-dog love muffins were out walking with my daughter one day. As they walked up the sidewalk a runner came by and as he approached my daughter he stopped and reached down for his shoes. Grimace, a sweet pug, started snarling and leaping towards the man. Meathead, an English Bull dog started strongly pulling my daughter in the opposite direction. Both dogs sensed something a-miss and were acting to remove my daughter from the perceived "threat". I listen to dogs. They know things we do not. You were very brave..God was right there protecting you and Copper. I think it's so amazing how dogs have a 6th sense about what is going around about them. Glad the story came out O.K. I'm really surprised you didn't make this story into a continued one..make us wait for the rest of the story.. I was holding my breath, and it really is times like this, that you're glad they listen, any other time when they don't kinda makes it okay, doesn't it? Glad everything turned out ok, and for-the-love-of-Dog, Moon..stay in the fence! We all should have a dog like Moon! Pit Bulls scare the bejabbers out of me. Glad it all turned out OK with no one injured. I am glad your doggy is a good listener, that could have got really ugly.